While there are plenty of competitors in the marketplace, Microsoft is still a major player in the tech industry, commanding a huge share of the operating system market. Microsoft has made some major changes in recent years, including an announcement on the handling of 2019 licensing for its flagship Office suite. Here’s what you need to know about Office 2019 for the upcoming year. Like earlier versions of the Office 365 product line, Office 2019 includes access to popular programs like Word, Excel, Outlook, PowerPoint, Visio, Project and Publisher. As with the current suite of products, Office 2019 has been designed to take advantage of the cloud. If you are already a cloud user, you can take advantage of all the new features and benefits of Office 2019, but even non-cloud based businesses can benefit from the upgrade. If your business has been using the installable version of Office 365 over the past several years, you should already have received a number of upgrades and new features. Users of the installable version of Office 365 will continue to receive those updates and enhancements on a monthly basis, including additional security features and the latest in artificial intelligence. It is important to note that unlike the installable version of Office 365, Microsoft Office 2019 has been designed as a one-time release. As such, the product will not receive any future feature updates. It does, however, include a number of exciting features and benefits. Microsoft has included a number of mobile features in its new Office 2019 product, including access to apps that allow users to create more content in less time. PowerPoint fans will be able to create cinematic quality slide shows using features like Morph and Zoom, while Excel users will find new features that make data analysis and chart creation easier. The new Office 2019 should also make email easier and less obtrusive – the newest version of Outlook automatically moves less important emails out of the way, so users can focus on what is truly important. Watch the following video for an overview of all the new features in Office 2019. There has been some confusion concerning the Office 2019, and whether existing users of Office 365 will need to upgrade their licenses. As with past Microsoft releases, conflicting information has emerged, but here is what we know about Office 2019. Part of the confusion stems from the fact that Microsoft offers not one but two purchasing options. Users who make a one-time purchase of Microsoft Office may use the software as long as they like, but they will not have access to the major updates subscription-based buyers are entitled to. 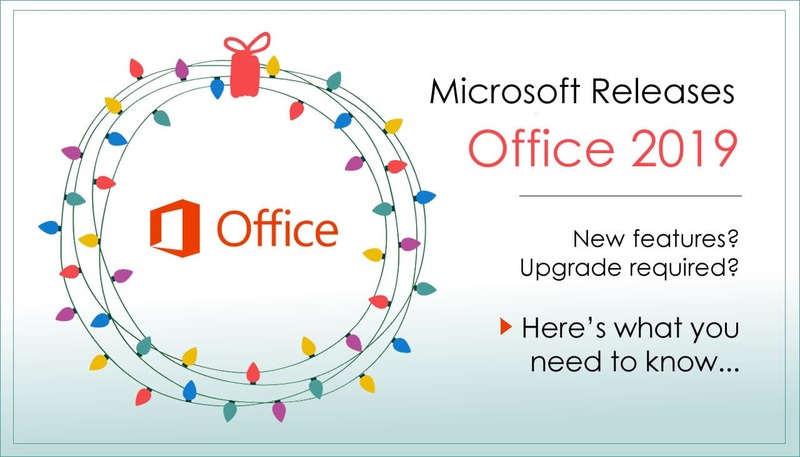 For those one-time software buyers, an additional purchase of Office 2019 will be required. For current Office 365 subscribers, licensing is a little more straightforward. If your business uses the subscription-based Office 365 that includes Office, you already have access to all of the features. If you want to keep enjoying updates and cloud-based support, maintaining your current subscription to Office 365 should be all you need to do. ***It is important to note, there may be exceptions to this, so regardless of your current plan, we encourage all businesses to contact us online or by phone at 262-522-8560 so we can check your licensing carefully and confirm whether this additional purchase will be needed for your business. Software licensing can get pretty complex, so if you need additional information on the newest version of Microsoft Office, feel free to contact us online or call us at 262-522-8560. Ontech Systems is dedicated to the success of your business, and we are always here to help.